One hundred twenty years after the birth of the Dow Jones Industrial Average, there’s hardly a news story about the American stock market that doesn’t mention “the Dow”—for its iconic presence in American financial markets is undeniable. Yet, over the course of its 120 years of existence, to what extent has the Dow reflected the nature of the U.S. economy at large? It was not until the spring of 1896 that Charles Dow had developed his ideas to the point where he completely removed the railroad issues from his general market average and created two separate Averages: the Industrials and the Railroads. Shortly thereafter, The Wall Street Journal reported an independent Railroad Average, as well as an Average composed entirely of industrial and natural resource concerns, which became known as the Dow Jones Industrial Average (DJIA). Although both Averages first appeared on May 26, 1896, the Industrials were not regularly reported in the WSJ until October 7 of that year. Their starting point that day was a mere 40.94—a long way from where the DJIA sits today. Early on, the Industrials were a dynamic Average, changing composition on an almost monthly basis. Because the DJIA was supposed to represent the current business environment in the U.S., Charles Dow actively sought to include the key industries of his time: sugar, spirits, leather, cordage, tobacco, gas, lead, rubber, coal, iron, and electrical products. Therefore, the original Industrial Average boasted names like American Cotton Oil, American Sugar, Distilling & Cattle Feeding, Laclede Gas, National Lead, and U.S. Rubber. This is a far cry from today’s Index, which is dominated by retailing, oil, technology, pharmaceuticals, and entertainment companies, and includes such names as American Express, Walt Disney, Merck, Microsoft, and United Technologies. The grid below has the Dow’s most up-to-date holdings. 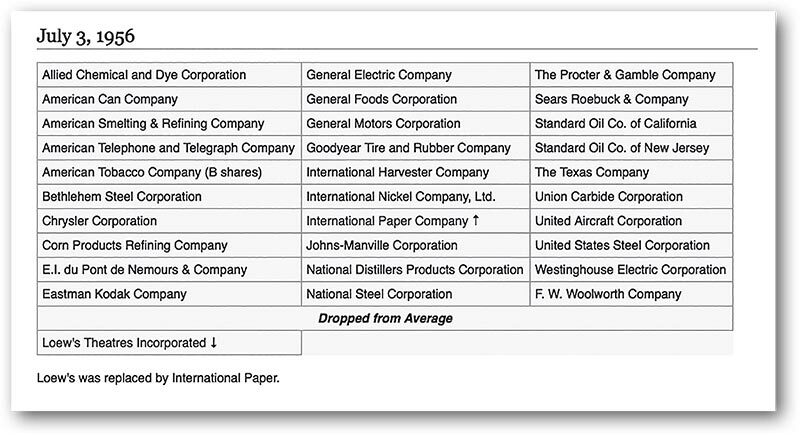 The only company on the original list of Industrials that has endured to the present day is General Electric, although it has been removed from the Index twice (only to be reinstated later, obviously). The original Railroad Average was replaced by the more generalized Transportation Average after a number of trucking, airline and air-shipping concerns were added to it in 1970. These changes also included the first Dow stocks to come from the tech-heavy Nasdaq, not just from the New York Stock Exchange (NYSE). The last major development in DJIA history was the 15-stock Dow Jones Utilities Average, which first appeared in 1929. Despite public perception to the contrary, the Dow Averages have continued to change in recent years—and these alterations are far from accidental. A new component has been added, on average, every three years since the inception of the Average. The editors of the Dow Jones Indices oversee any shifts in the composition of the Averages and see that periodic adjustments are made, both to ensure the Dow’s continued reflection of the current business climate and to compensate for mergers and bankruptcies involving Dow stocks. This function has maintained Charles Dow’s original commitment to ensure that the mix of companies on the Averages remains analogous to the broader market. When choosing a company to represent a specific industry in the Dow, the following criteria are considered: Is the company a leader? How long has it been around? Does it treat its shareholders well? What is its reputation in the industry? 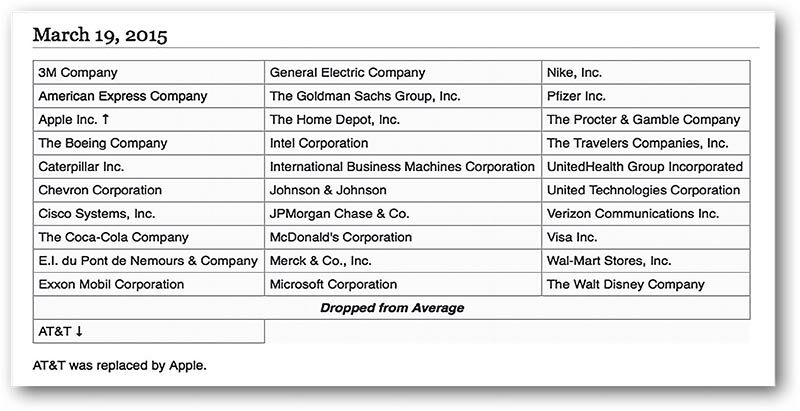 Dow companies must be leaders in a particular industry or sector. The Dow has traditionally comprised corporate giants and massive companies whose shares have been publicly traded for decades. Although companies like Coca-Cola (NYSE: KO) and McDonald’s (NYSE: MCD) might appear outdated compared to the Amazons and Facebooks of the world, that Coke and McDonald’s have been multi-billiondollar companies for decades suggests an incredible staying power that their juvenile competition has yet to demonstrate. Though the presence of decades-old companies like Caterpillar (NYSE: CAT) on the Index may also make it appear antiquated, many investors forget that Caterpillar is a global company that helps to develop and modernize the world. 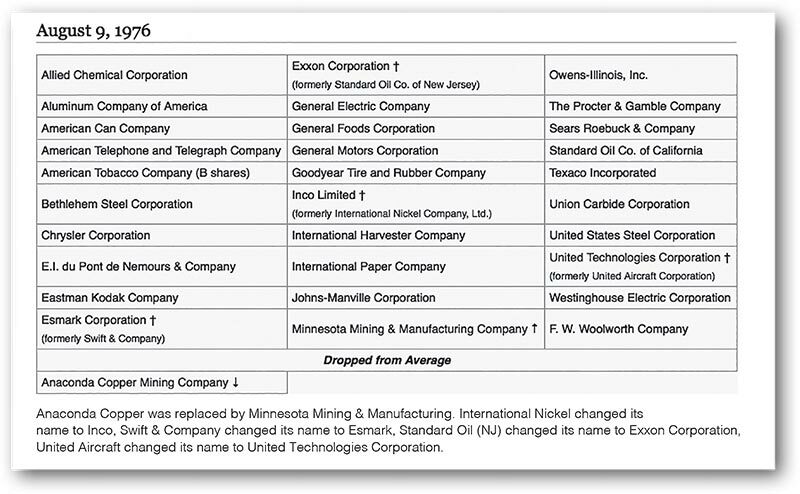 An example of the logic used to maintain the Dow’s weighting is illustrated by the changes made in 1985 after Dow component General Foods was bought out by tobacco giant Philip Morris. The sudden addition of Philip Morris to the Average upset the industry weighting by doubling the number of tobacco companies (American Brands, formerly American Tobacco, was already there). As a result, the editors of the Index decided to drop American Brands entirely and add McDonald’s to the Industrial Average to better represent the restaurant industry. Regarding bankruptcies, the only company that has ever fallen off of the DJIA due to financial difficulties is the John Manville Company, which was caught in a wave of litigation relating to its innovative fire-retardant product, asbestos. Chrysler’s run-in with red ink—eventually resolved by a bailout from the U.S. government— was probably responsible for its deletion in the early 1980s, although the company never did, in fact, go bankrupt. The only other high-profile bankruptcy was Texaco in 1987, after its attempted acquisition of Getty Oil resulted in a major fine due to a breach of contract, but Texaco was not removed from the Dow until 1997. 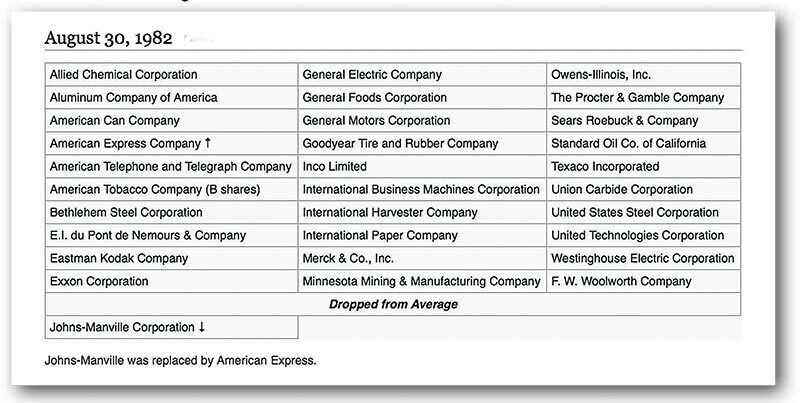 Even Exxon’s Valdez disaster and Union Carbide’s Bopahl tragedy were not enough to get them kicked off the Index. Currently, 30 stocks are listed in the Dow Jones Industrial Average, 20 in the Dow Jones Transportation Average, and 15 in the Dow Jones Utilities Average. Sometimes our white papers are heavy and cumbersome with detailed information on U.S. and world geopolitical and economic driver theories. Other times, we write with more levity, like our Presidential Election Cycle and Santa Claus rally papers from a few months ago. 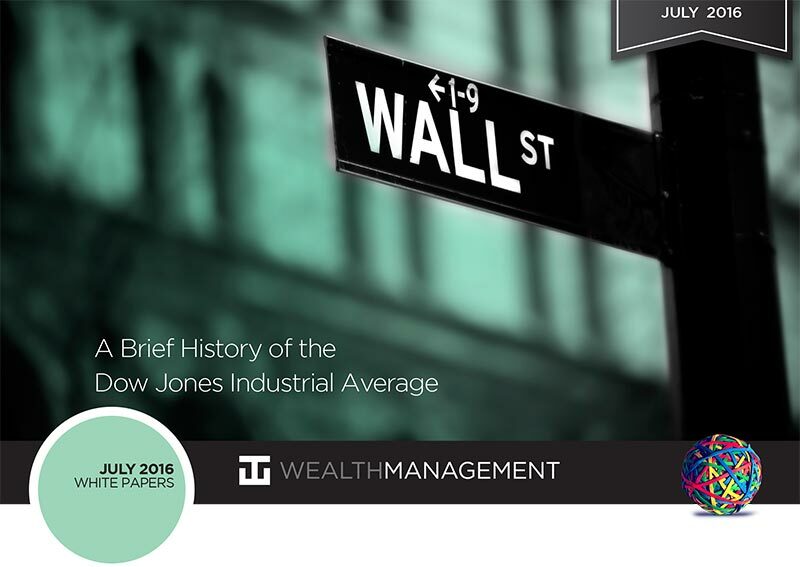 The WT Wealth Management white paper this month on the Dow Jones Industrial Average falls somewhere in-between. It’s surprising, however, that many people talk about the DJIA everyday (and no wonder: it gets all the headlines) but don’t know it’s compromised of only 30 stocks, they are unfamiliar with the Dow’s long history and are not even aware of its Transportation and Utilities Index counterparts. To those ends, this white paper was meant to be just as nostalgic as informative. Children today will never flip through the Sears Catalog, sit at a Woolworth’s counter, or wait a week for pictures to be developed from Kodak film onto Kodak paper—that’s a lost generation. Thankfully, I remember those days; they show me, as an advisor, that nothing lasts forever and innovation will always change and shape our country. So its crucial to look far down the line for companies that will appear on our radar screens as well as those that will fade away. Is the Dow Jones Industrial Average still a great indicator for measuring your investment success? Probably not. It doesn’t include many of today’s major technology players that drive the economy and change the landscape in which we live. Plus, it’s only 30 stocks—hardly a broad representation of the American landscape. At WT Wealth Management we use the Standard & Poor 500 as our basic measurement benchmark. With its representation of America’s largest 500 companies, it covers nine different sectors, from Industrials to Utilities to HealthCare to Consumer Discretionary. Which means the S&P 500 represents the entire universe of the American economy much more fairly and broadly than the DJIA does, in part because the S&P 500 includes the major drivers of today’s economy: Wells Fargo, Amazon, Facebook, Google, FedEx, UPS, MasterCard, etc., etc. WT Wealth Management is a manager of Separately Managed Accounts (SMA). Past performance is no indication of future performance. With SMA’s, performance can vary widely from investor to investor as each portfolio is individually constructed and allocation weightings are determined based on economic and market conditions the day the funds are invested. In a SMA you own individual ETFs and as managers we have the freedom and flexibility to tailor the portfolio to address your personal risk tolerance and investment objectives – thus making your account “separate” and distinct from all others we potentially managed. An investment in the strategy is not insured or guaranteed by the Federal Deposit Insurance Corporation or any other government agency. WT Wealth Management is a registered investment adviser in Arizona, California, Nevada, New York and Washington with offices in Scottsdale, AZ Jackson, WY and Napa Valley, CA. WT Wealth Management may only transact business in those states in which it is registered, or qualifies for an exemption or exclusion from registration requirements. Individualized responses to persons that involve either the effecting of transaction in securities, or the rendering of personalized investment advice for compensation, will not be made without registration or exemption. WT Wealth Managements web site is limited to the dissemination of general information pertaining to its advisory services, together with access to additional investment-related information, publications, and links. Accordingly, the publication of WT Wealth Management web site on the Internet should not be construed by any consumer and/or prospective client as WT Wealth Management solicitation to effect, or attempt to effect transactions in securities, or the rendering of personalized investment advice for compensation, over the Internet. Any subsequent, direct communication by WT Wealth Management with a prospective client shall be conducted by a representative that is either registered or qualifies for an exemption or exclusion from registration in the state where the prospective client resides. For information pertaining to the registration status of WT Wealth Management, please contact the state securities regulators for those states in which WT Wealth Management maintains a registration filing. A copy of WT Wealth Management’s current written disclosure statement discussing WT Wealth Management’s business operations, services, and fees is available at the SEC’s investment adviser public information website - www.adviserinfo.sec.gov or from WT Wealth Management upon written request. WT Wealth Management does not make any representations or warranties as to the accuracy, timeliness, suitability, completeness, or relevance of any information prepared by any unaffiliated third party, whether linked to WT Wealth Management’s web site or incorporated herein, and takes no responsibility therefor. All such information is provided solely for convenience purposes only and all users thereof should be guided accordingly.